Hackerbot labs is working on a project to bring to toorcamp. Specifically, we are going to do MAD SCIENCE! Thanks to the toorcon folks for additional funding this project. Goal: Shoot a large laser into the sky in order to measure the diffuse reflections of the atmosphere using a distributed array of semi-autonomous sensors. Challenges: Getting clearance from the regulatory folks, ensuring the safety of volunteers, building ample power supplies and cooling the device. Status: The lasers are working on the bench via bench supplies. The cooling system has proven to be rather tricky as the lasers overheat after running for a few minutes. A manufacturer of projectors has been putting 24 1 watt laser diodes into their devices in order to produce light. 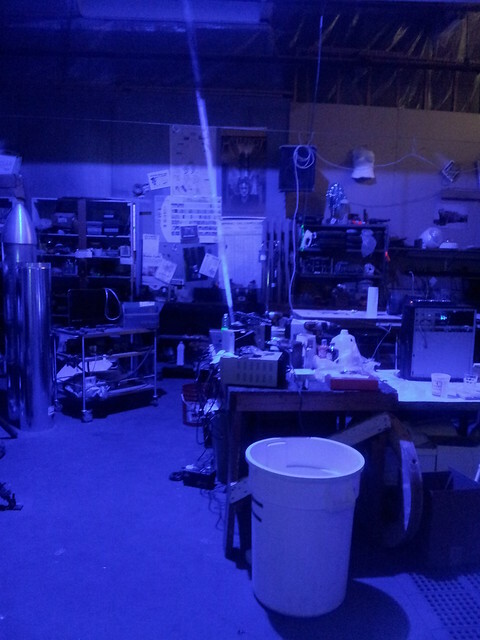 Interestingly, they use 445nm blue light to produce both the blue and the green channels for the projector. This is done by pulsing high power onto a spinning florescent wheel synced to the refresh rate which produces 544nm +/- 10nm green light. This reflected light gets recombined in the projector with the 445nm light, along with light from a RED (632nm?) LED light using a set of dichroic filters. The side effect of this design is that they have 24 high power lasers in one large optical assembly. However, cooling support on this device is only designed cool the lasers if they are running at ¼ of the nominal power RMS. We have extracted an array of these diodes and machined off the base of the heatsink in order to thermally bond it to a waterblock. Using a 150 watt Peltier-based water chiller set to 10c, the water slowly warms up until the point that the diodes hit thermal run-away. We have at least 200 watts of heat to extract from a small area, not including the heating of the water due to ambient air. The internal heatsink design leaves large machined pockets between the laser diodes and the heatsink. Despite this interface being about 3” x .75”, only about 15% of the interface is really connected. This works out to be about 125 watts per square centimeter. This is a somewhat frighteningly large number from a thermal management perspective. While it’s clear this design works fine for the designed application of this array, running the diodes at full power means it simply doesn’t cut it. The overall cooling capabilities of the chiller are too small. Increasing the heat transfer in watts will likely be required; It’s hard to estimate what the ambient air temp will be like in general operation, but if we assume a max of 40c (I sure hope this toorcamp is thermally nothing like the last one).. we will have to spend extra energy in order to overcome the higher ambient air temp. - Purchased additional Peltier blocks (specifically, we have added 48 additional Peltier blocks, up from the 16 in the existing chiller). - Machined a custom waterblock to pull heat from the sides of the laser array. We quickly learned that our existing pumps are simply not up to the task of pumping water through a total of 11 waterblocks (2 built in, 2 x 3 in the new Peltier blocks, 3 up on the laser), plus pump the cooled water up 3 meters to the location of the lasers. The total pressure requirements are somewhere around 80 psi. Attempting to use low-pressure high flow pumps from Harbor freight was amusing from a spray-coolant-all-over-the-lab-perspective, but we need a “boost” pump which can handle high pressure at lower flow. However, it does seem like the additional cooling capabilities will meet the need. For control, I've hot-wired up the output of the chiller we have (which provides PWM control for the TECs) to the additional cooling system. We hope to replace this control system with an OSPID once it's been modified it to provide PWM output. If I was going to build this chiller again, I would likely of just purchased a Vapor Change chiller; they have a pretty high pricetag but all of these parts are really adding up. Peltier-based chillers are great up to a point, but it gets tricky to extract all of the heat they generate. There is a reason why large cooling capacity chillers use vapor change and not Peltier - -it's just cheaper. The laser diode array is wired up 6 diodes in series; that means we need to deliver 27.5volts at about 1.5 amps times 6. As diodes like this need to be current limited, we need to find power drivers which can deliver this many watts in a stable configuration. In addition, safety protocols have additional requirements on the drivers, specifically delayed-turn on and digital on/off control. We found some nice dc switching power boards based on the LM2596 chip which should give us the control we need after some minor modification for control. This is still only in conceptual design and has not been tested. It’s important that the folks in charge of the United States National Airspace (and in this case, also Canada) have opportunity to review the safety of lasers shot into the sky and offer notice to airmen (NOTAM), advice for laser operators and finally offer letters of objection or non-objection. Part of this process is to apply to the FAA using information provided in AC70-1 and complete form 7140-1. After this gets submitted the FAA reviews the application, reviews the site, operational plans, safety energy calculations and any impact to major flight routes. As part of this application we needed to calculate the energy densities of the laser at different positions in the sky - - it’s not just eye-hazard they are worried about, but also potential distraction of pilots while they may be performing critical tasks. The energy density calculations are based on the output power of each beam, plus the divergence angle of the beam. As our lasers are not circular we had to perform a slightly modified version of this calculation as provided by Ansi Z136. The FAA is currently reviewing our application, but has verbally communicated to us that they don’t think it will be a problem. More information soon! - The laser will be 3 meters above the ground in a rigid structure, pointed up. - The laser has several interlocks to automatically detect the presence of bags of mostly water and shut off. - The control system also monitors thermal state and “tilt”. If something gets knocked over or there is an earthquake, the laser shuts off. - The energy densities are such that scatter from the beam or objects in the beam will not be a hazard if you are greater than 3 feet from the beam (which based on the placement, this will not be a problem unless you are skydiving into the laser). - Operators who need to be close to the laser during setup and alignment will be wearing safety glasses OD 4 or greater. - We will have a laser Safe Operating Protocol (SOP) which has a clear process for starting up and shutting down the laser.